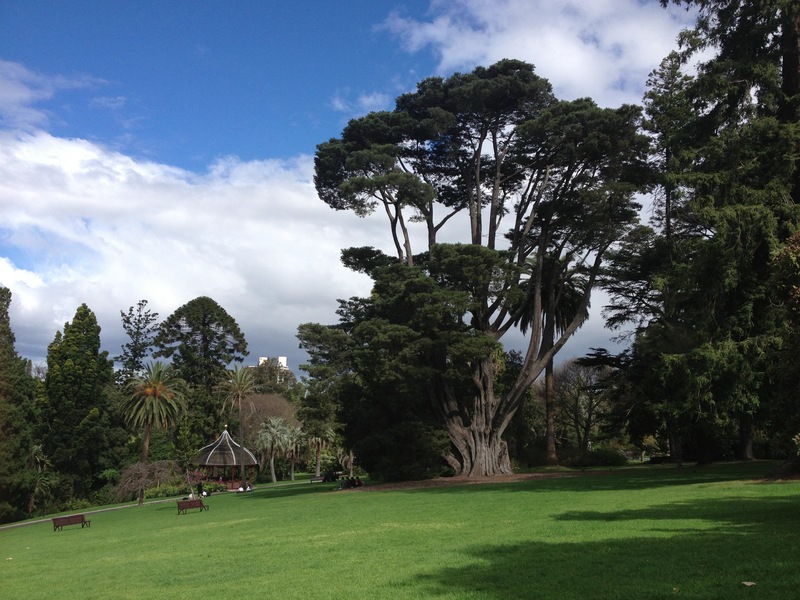 Melbourne’s Royal Botanical Gardens have been a regular feature of my time in Melbourne; I’ve spent several afternoons strolling through the grounds, chilling by the lake, or getting involved in what ever I’m currently reading. Situated in the Domain Gardens, it’s less than ten minutes from my doorstep so it’s not like it’s difficult for me to take a wander over there, especially if the weather’s good. 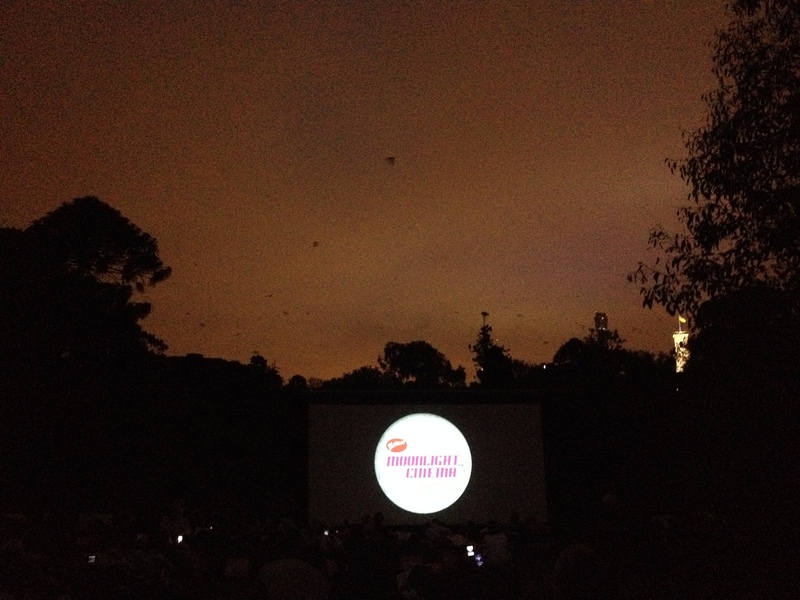 Some time ago I discovered that during the summer it’s also home to Melbourne’s Moonlight Cinema. From my brief time in other major Australian cities, I’m under the impression that the open-air cinema is fairly common. There’s at least one more in Melbourne, on the rooftop of The Curtin House in the city centre. I’d been keen to go along since I was first aware of it’s existence but had never really gotten around to making any kind of plans. Fortunately, I have good friends who also like to do things and managed to tag along with Matt and Sarah when they booked tickets. The gardens usually close at sunset, I know this because I’ve been locked in once and had to walk to each gate until I found someone from security who could let me out, so it was a novel experience to be there after dark. There’s an additional attraction just after the sun goes down as the huge colony of flying foxes who live in the gardens take off for their nightly excursions across the city. The black dots you can see in the poor quality photo above are some of them in flight. I’ve been seeing bats fly across the sky since I arrived and it is still a little bit mind-blowing and a regular reminder that I am most definitely not at home. It was Matt’s birthday this week and as a treat his parents had arranged for pizzas to be delivered to the gardens for us and for bean bags for us to relax and recline on, so my thanks goes out to them! We settled down on to these super comfortable sun-lounger-esque bean bags, with a beer in hand and stomachs full of pizza ready to watch the Railway Man. I’ll be honest, this was probably the most comfortable I’ve been at a cinema, the temperature didn’t drop too much either so all-in-all it was a pleasant experience. As for the film, it was pretty good but I couldn’t help but feel that it was a significantly weaker representation of what the book may offer but certainly worth a watch. 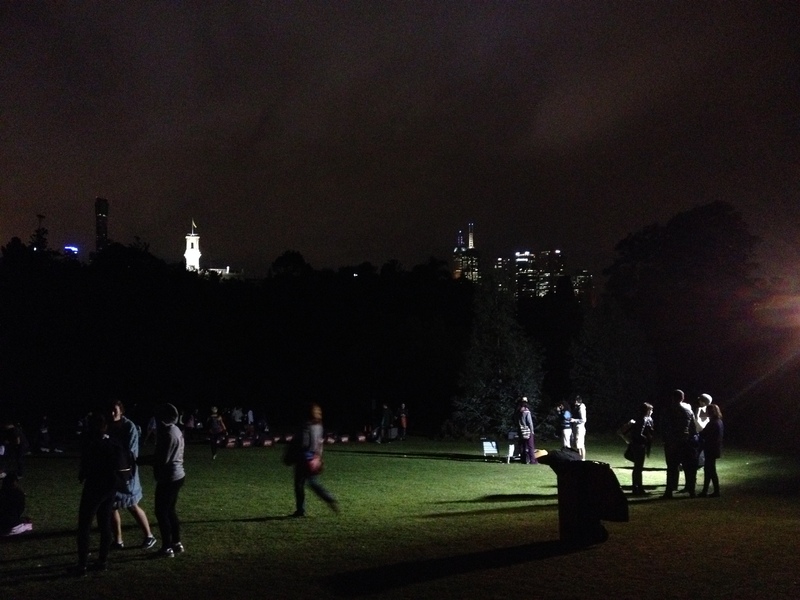 If you get a really good spot on the hill, you’re able to watch the film with the city skyline just visible through the trees. Just another one of those occasions that really emphasizes what a great city Melbourne is. I’m still not over it, finding my enjoyment in living here on the rise again. Once the film ended we were informed that the lawn sprinklers would soon be turned on and we’d have to make a quick exit. I’ve just had a look at the schedule as the cinema runs to a close and their are a couple more films coming up that I’d enjoy seeing so, assuming I get my act together, I suspect I may be back before the summer is over.